Cover, zipper and threading are all anti-wicking and fluid-resistant. 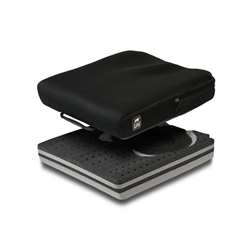 Firmness is determined by the cushion width, the larger the width, the firmer the cushion. 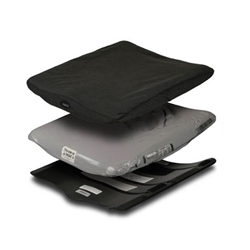 Standard lumbar support cushion attaches to the wheelchair push handles and assists in the prevention of leaning to one side or slouching. 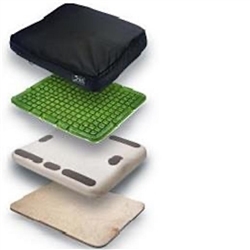 Soft foam provides comfortable sitting surface. 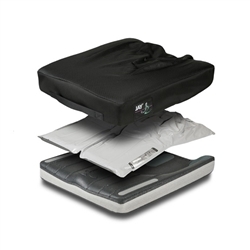 At just 1.71 lbs., this is the lightest weight foam cushion, great for ultra lightweight aluminum and titanium chairs. Pre-contoured for pressure reduction, positioning and stability. - Available in 33 sizes! Increases your tolerance to sitting all day with a solid, basic design. Curved Shell with Soft Foam - Strap or Clamp Style Hardware. 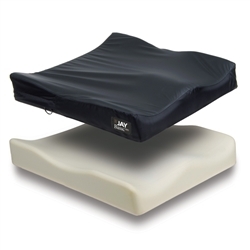 Fluid gel pad reduces pressure on the left, right and rear sections of the cushion. Made of soft, contoured foam with built-in Jay gel. Recommended for up to four hours of use outside of wheelchair - Available in junior and adult sizes. 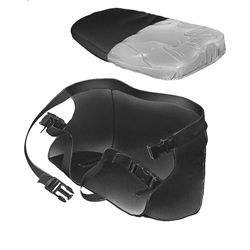 Take your cushion with you with this body attaching sling that has a foam base and gel fluid pad. Easy to install with wrap-around Velcro sleeves - 1 1/4" thick foam for a supportive general use back. A dual cover design, featuring a fluid and moisture-resistant Dartex inner cover and an outer X-Static cover that adds comfort and breathability. Machine washable outer cover made from anti-microbial X-Static fiber. Contoured for correct anatomical fit - Moisture-proof closed cell foam base is easily. 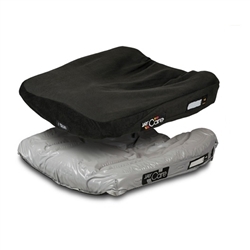 3" deep seat well provides excellent pressure and shear reduction for those at a high risk for skin breakdown. Deep seat well increases contact and promotes superior pressure distribution. Three free cover options available, choose either a stretch, microclimatic or incontinent-resistant. Features outstanding pressure distribution, comfort, heat and moisture dissipation, and optimal stability. 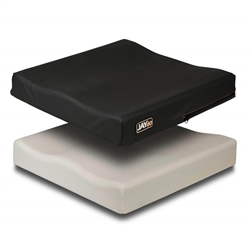 A Visco foam top layer and gel fluid middle layer make this cushion perfect for evenly distributing your weight. A pelvic loading area and two lateral pelvic wedges that provide lateral stability. Innovative body-measuring science provides ease of fitting while maximizing stability and ultimate skin protection. Low maintenance and customizable with three cushion cover options. 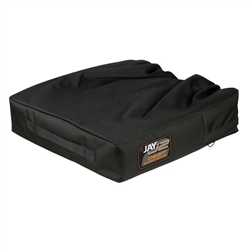 The New Jay X2 cushion is a maintenance free, liquid filled, cushion that will be replaced the Jay Active and the Jay Extreme. 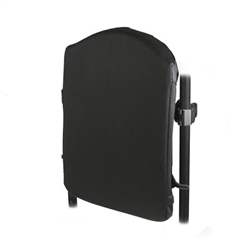 Contoured solid seat pan replaces the sling seat upholstery for support and stability. 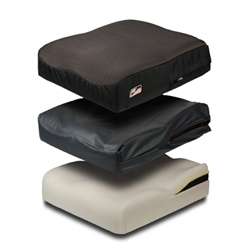 Integrated, contoured solid seat pan with a soft foam layer and fluid seat pad designed to replace the sling upholstery. 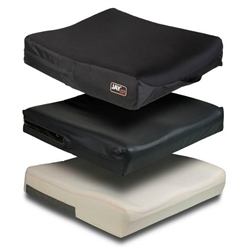 Designed to stabilize the pelvis, protect the skin, and position the body, JAY’s comprehensive range of wheelchair cushions are highly comfortable, lightweight, low maintenance and can accommodate a wide range of mobility seating requirements. 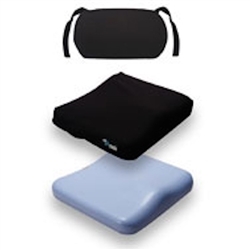 Were glad to help you find a JAY wheelchair cushion that suits your individual needs. Please contact on of our certified seating experts at 866-218-0902.